Why To Stay at the Water Club by Borgata in Atlantic City.The Borgata Hotel & Spa opened in the marina area of Atlantic City about ten years ago which completely changed the landscape of entertainment and casino offerings. For years, Atlantic City has been a paradise for retired day trippers from Philadelphia enjoying the hotel buffets . They were happy, the casinos were happy, but the young people stayed away. The Borgata changed that, at least in the marina area by offering a contemporary style hotel with a focus on restaurants, intimate concerts and a spa. This quickly made it a destination unto itself. People went to the borgata to drink, dance and gamble. It was and is a fun place to visit. Attracting many new guests from Philly and NYC, the Borgata quickly needed to expand so it built The Water Club by Borgata attached to gambling floor by a row of shops, including a specialty wine store. The Water Club is a bit more serene than the Borgata hotel with a smaller lobby and sensory pleasing colors incorporating water, nature and art. Hotel guests have access to five pools on the property (you need to wear a wristband for access) which is a main draw to the hotel. Arriving later in the day on a Sunday (check-in is 5 pm – I’m not a fan of the casino check-in time given the early 11 am check-out) we parked via valet. We planned ahead due to the fact that we heard of the nightmares of parking in the surface lot and people having to lug their bags through the casino floor to The Water Club. The valet entrance has a bellman when you arrive at the hotel. Valet parking itself is only five dollars which I found to be quite inexpensive. I have gone to outlet malls in Florida and payed twenty including tip. Needless to say I gladly payed the 5 dollars. 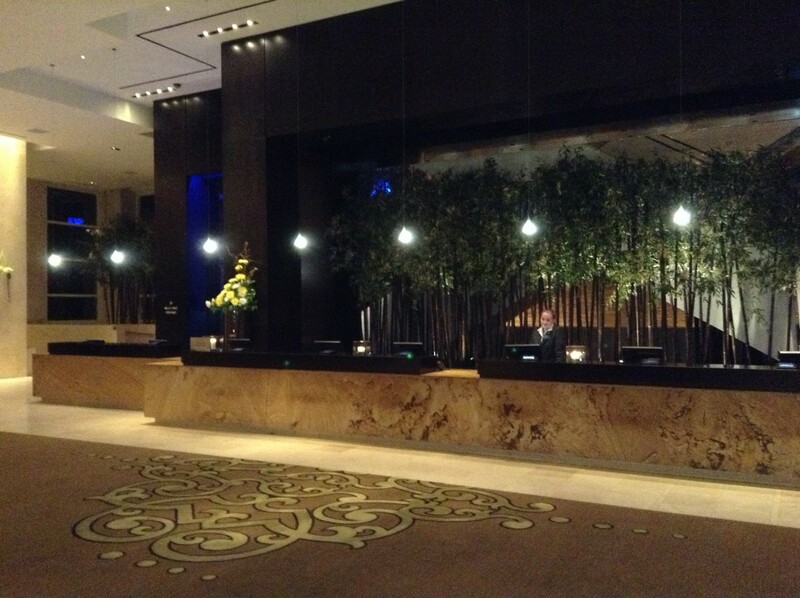 We arrived a bit early and were able to check in to our room which was nice. We picked the high view since we love to look out at the city from those floor to ceiling windows found all over Atlantic City. We had a choice of high/low, view/no view so we told the front desk associate that we wanted a high view room pick. 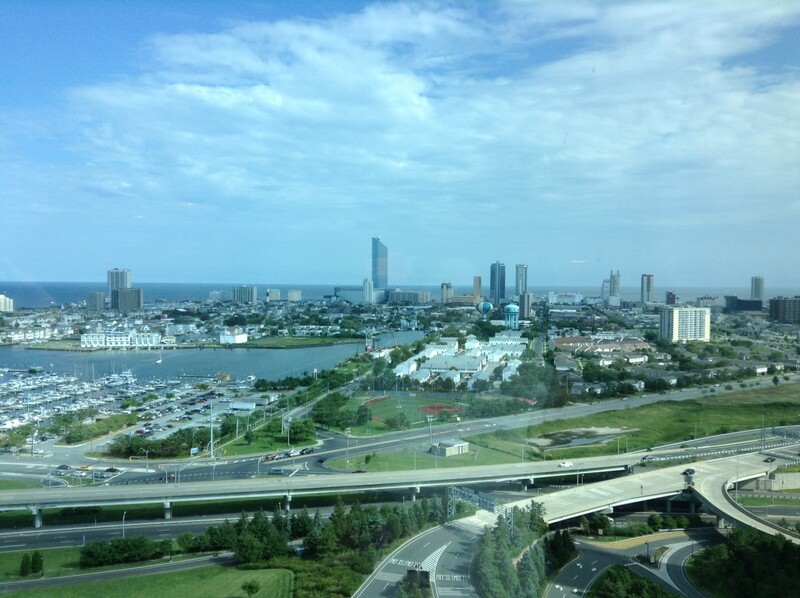 We were assigned a room on the 21st floor and it had a view of the marina and Atlantic City hotels in the distance. 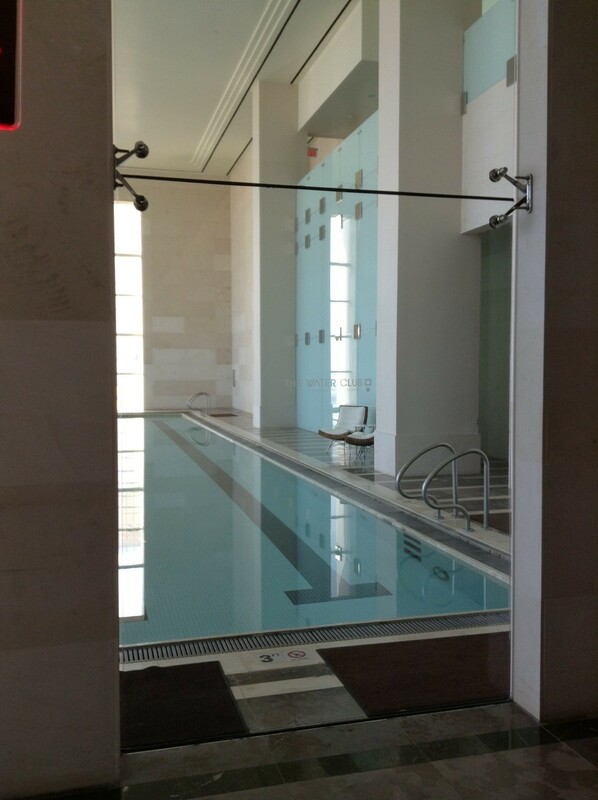 If you pressed your face to the window, you could see the pools below – one indoor and one outdoor. 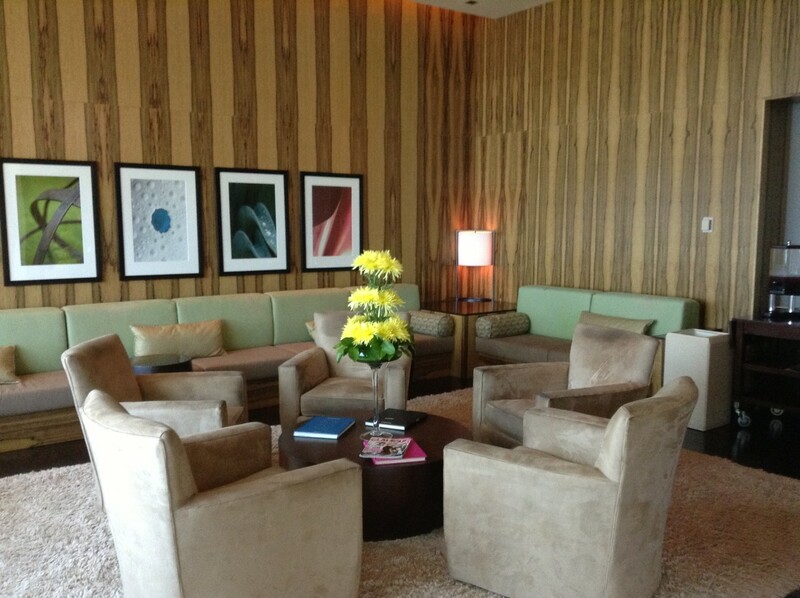 The rooms are modern design using the color palette of chocolate, teal and white, which are used throughout the hotel. 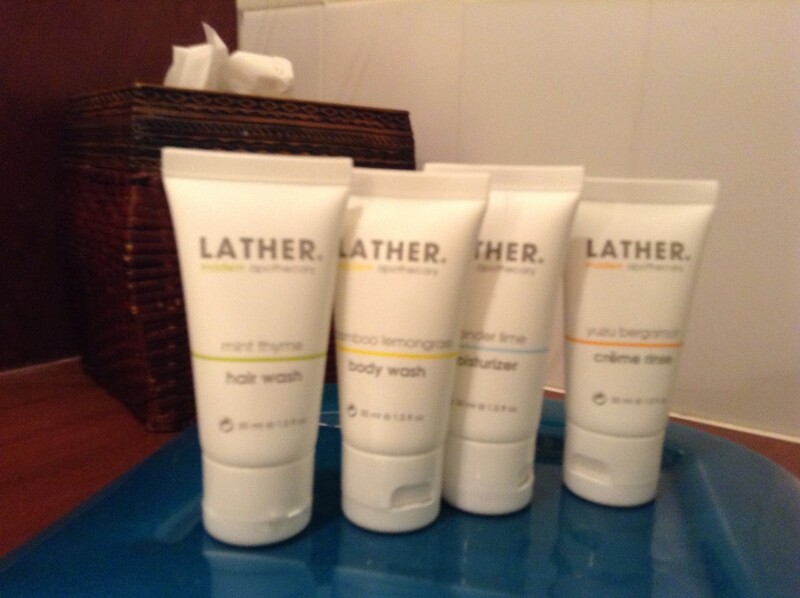 Every stay, I always comment on the teal bedsheet, leather throw pillows and beige bath towels – I can’t think of any hotel stay where they didn’t use white, can you? The bathroom has a separate water closet, large walk in shower and ample counter space. The lighting is a bit dark if you need to do make-up. 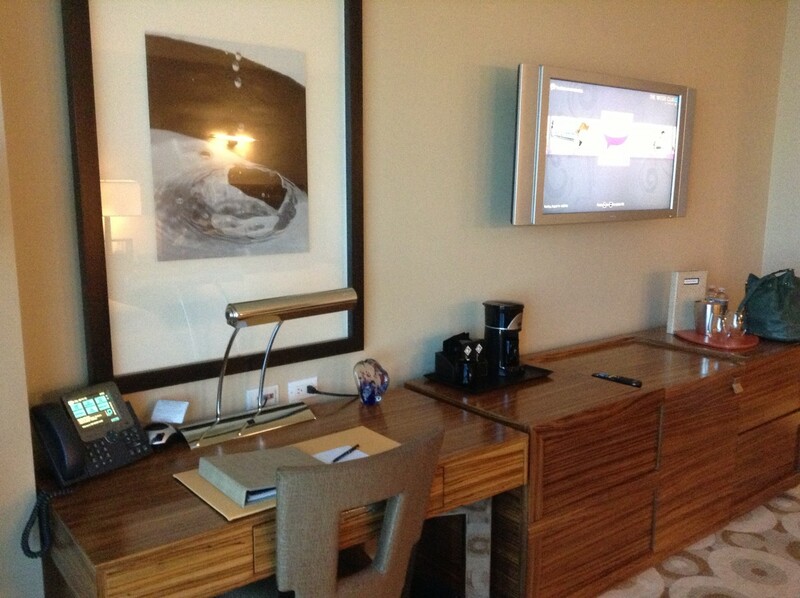 The room has a flat screen tv, large desk area and an empty minibar so you can stock it with your own food/drink. There is a small lounge restaurant at The Water Club, the Sunroom, but we didn’t eat there, opting to explore the Borgata restaurants. We would have a plethora of options and since all are good, I thought I’d look at dessert menus to narrow the choices. After a tough competition, we lucked out with a short wait at Wolfgang Puck patio (always best to make a dinner reservation for the restaurants). 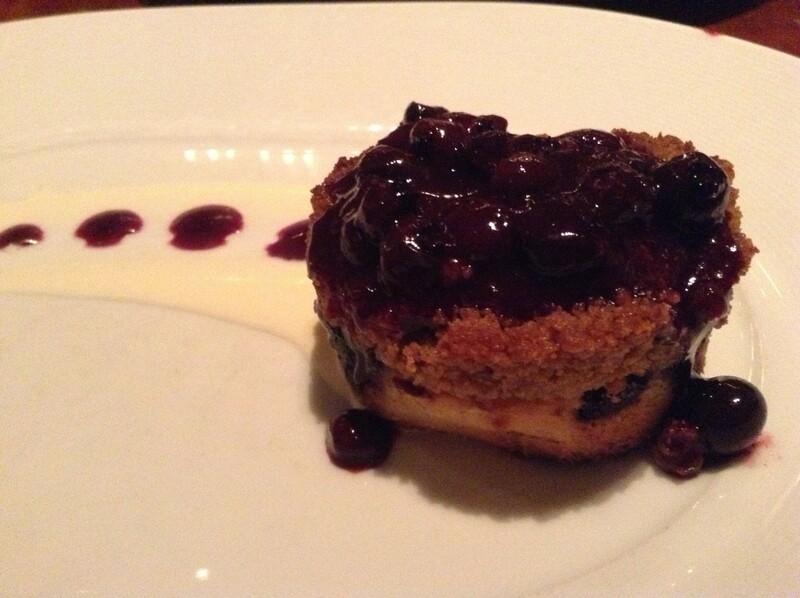 The menu here has something for everyone and to date with multiple visits, has not disappointed. 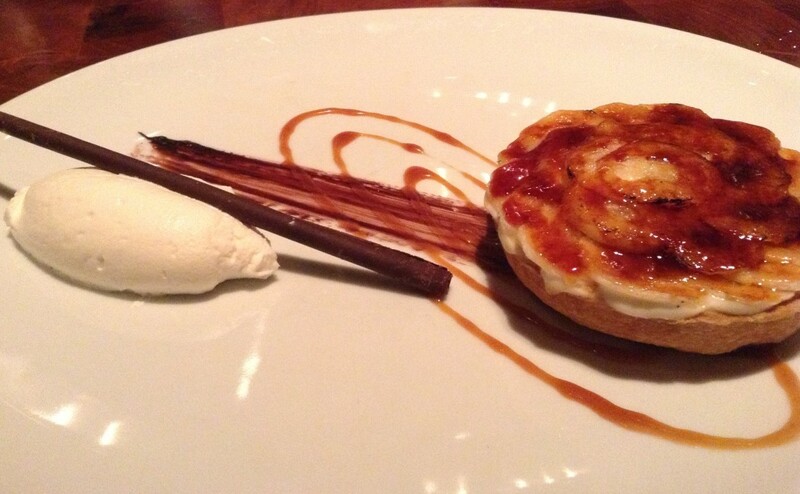 On this visit, our desserts were definitely a highlight. If we were in Vegas, I’d be at the Pai Gow table, but in AC, the players & dealers are not as patient and the limits not so low therefore, I am relegated to the slot machines. Since my luck is nil, I tend to be risk adverse and take $200 (shoe money) to have fun with. I had $30 in slot dollars (woohoo! free money!) extra to gamble with – i was excited to hit a bonus round until my ten free spins netted a whopping $1.30! The lady next to me also had the bonus, she won $50 and sadly looked at my “winnings”. The casino floor is a nice size with standard offerings, a lively poker room and sport book. Something for everyone. For a Sunday night, we decided to use our “free” comedy club passes that our basic casino card provided (sign up for the free card if you don’t have one). The normal ticket price is $20 for a 90 minute/3 comedian show. The comedy club is a large space similar to a movie theatre – get your drinks/snacks when you first arrive and walk up the steps to find a seat. The comedians were quite entertaining. The hotel complex houses two spas – Immersion Spa at The Water Club (located on the top floors of the hotel) and Spa Toccare at The Borgata. As a guest, this is actually a tough decision to make – which spa? Each offers different access and for this stay, I chose the Immersion Spa at The Water Club as I would have free access to the pool area where I could sit and relax looking out at the marina below (I would also have access to the gym but really who is here to work out? not me – I’m here to indulge). Once you check in and pay (note that an automatic 20% gratuity and tax are added to the treatment cost) you are led to the appropriate ladies or men’s changing rooms (there were many men using the spa for treatments which is good to see). The ladies area has a large waiting room with juice/water, headsets to listen to relaxing music and magazines to peruse while you wait. My female massage therapist, Jesus, would lead me to the elevator to go up to the treatment floor (you can choose male/female if you have a preference). 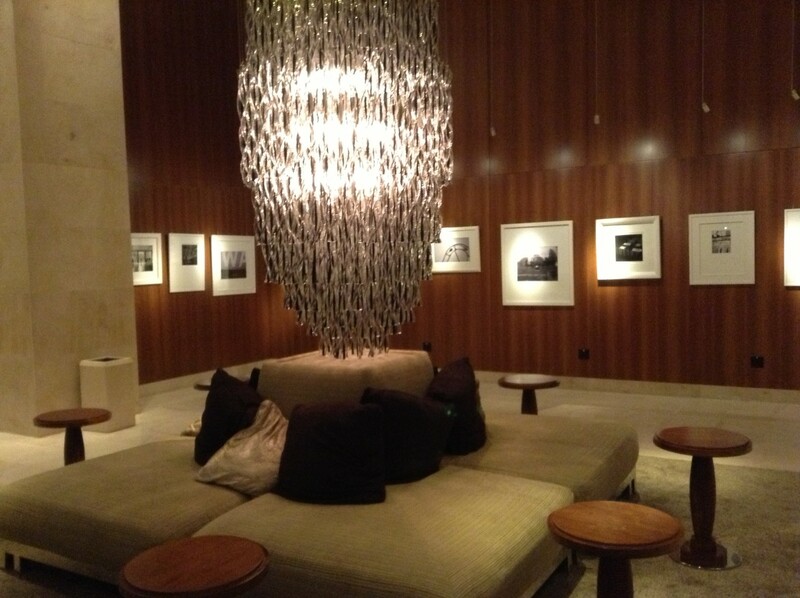 The wooden floors and rocks/lights along the walls was contemporary and quite calming (sorry no photos here). The treatment room continues the color motif – silky, satin teal sheets lined the heated treatment table with layers of blankets on top and chocolate marble counters. The room was dark and the music was classic spa soothing (the kind you like when you are there but if you purchased for your home would not quite transport you back to the calm feeling) and at one point I thought i might fall asleep despite the deep tissue massage. Using oils and hot towels, the spa treatment was just what my overworked body and mind needed. After the treatments, I changed and took a book to lay out at the lounge chair by the pool overlooking the marina. The quiet space has a small spa menu if you’d like to eat here while you relax. I really could spend the whole day here but had to meet my friend to get ready for dinner in Atlantic City and a stroll on the boardwalk. 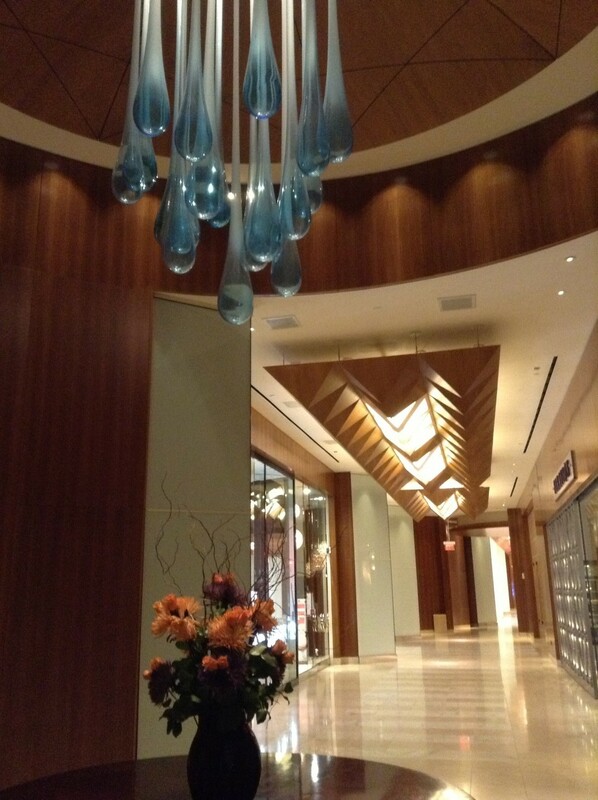 The Water Club at Borgata was a great hotel stay – comfortable and easy. From Philly, depending on traffic, it is an hour away by car. I suggest staying at least two nights if you want to unwind, relax and use the spa and pools – it seems rushed otherwise. You don’t need to gamble to enjoy your visit – if you like to eat, drink and be merry, you will enjoy it. If you like to relax and spa, you will enjoy it. Our room was $149 per night + tax as basic casino cardholders. The rates and offers vary depending on day of the week, seasons and the level of your casino card.